Fast Forward to June of this year and I decided to finally splash out and buy a desktop computer system powerful enough to take advantage of the full capabilities of iClone 6. Things like the new, enhanced G6 human avatars, access to the Indigo Render Plug-in for more realistic output, along with other features like tessellation, that take full advantage of DirectX11. (I really have no concept of what tessellation is and why I need it but it sure sounds important). To be honest, I mainly bought iClone 6 to remain current as I intend to offer the power of iClone to my Animation4Business clients. Much has changed with iClone 6's user interface. Initially it looks very different to iClone 5 but once you familiarize yourself with where the tools you use most often are, the new layout makes sense and it's not hard to find lesser used tools as they're logically located. 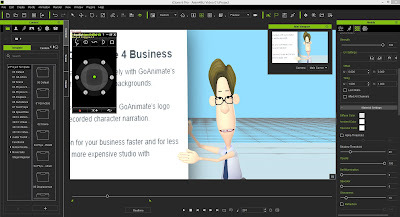 My first project with iClone 6 is a short 30 second promotional video for my Animation4Business website using my custom designed ToonMaker 2 Avatar. ToonMaker 2 Avatar in iClone 6. Although it's a fairly simple video with just a single character talking to camera I did storyboard out the key moments of the video as a guide. It's been really useful working from the storyboard, recreating actual key scenes, rather than making things up as I go along (which is often my default working process). I've also discovered it very easy to make simple custom props. In the image below you can see my character holding up a play icon that is made from a primitive box shape that I simply resized then edit the texture image in Serif's PhotoPlus X5 to be red with a white triangle arrow. surrounded by custom made props. 5 If you look closely you can also see an invoice prop created from an iProp blank piece of paper prop that I simply edited the texture to include the invoice printed on it. Took me about 10-15 minutes to create. Thus far I've worked on this animation over 5 non-consecutive days averaging about 3-4 hours each day, including writing and recording the audio script and hand drawing the storyboard. Most of the character animation is completely from scratch using motion key frames. I'm hoping to finish the video within the next couple of days. All I have left to do is one specific scene that shows a selection of different characters just standing around as a camera pans across from left to right. Then I'll refine some of the details of the entire animation and add some music. Usually you wouldn't do an entire animation in one iClone file but since this project is so short and doesn't really do anything iClone isn't capable of it's makes sense to keep it all within the one program. By my next post this animation should be finished. Look forward to seeing it along with a scene comparison with my storyboard and how the scenes actually look in the animation. This looks great! I can hardly wait until I will be able to get this program. hi Dave. you're infectiously inspiring! i need a help here. reallusion's got so much, i almost dont know what is what. for 2D, i thought CTA2 was all i needed to make cartoons. about to make a purchase now, i'm seeing so much stuff i can't differentiate; avatar tool kit (dunno what the kit comprises of), toonmaker2 (which you used to create the above character), cartoon motion, mr pose, monster workshop...etc. pardon my naivety here, but i'm trying not to buy duplicates of the same thing. all i wanna do is to create powerful 2D animation using reallusion. ALSO, which of the above tools does iclone6(which i guess is for 3D) become relevant ? heeeeeeeeeeeelp! If all you want to do is create 2D animation then CTA2 is all you need. 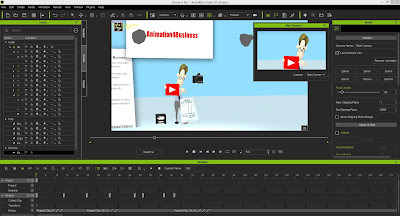 iClone and any of its associated content packs like ToonMaker, ToonMaker 2, Avatar Toolkit, Monster workshop etc. are all for 3D, Pixar style animation not 2D animation. CTA2 has a number of great content packs to extend your library with including the new Buddy's World characters if you're into creating South Park style animation or Gary Pye's Dan and Wendy characters and his extensive library of 2D props and sets. oh Dave! what can we do without u! 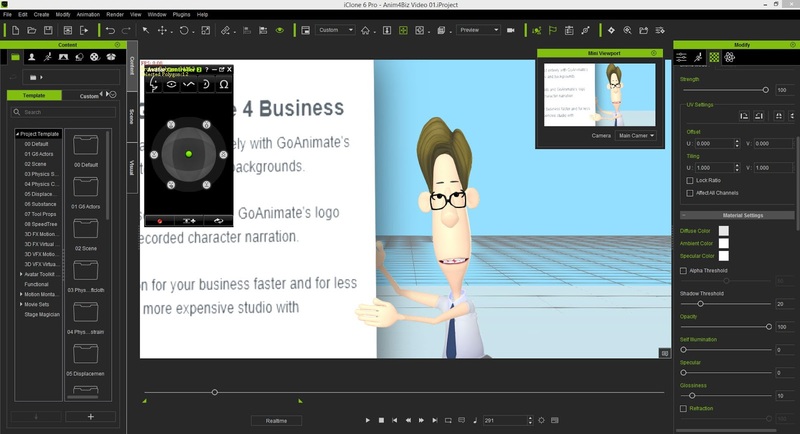 u inspired me to purchase goanimate, and it got me a whole lot of business & clients. now i can afford CTA2 without hesitation. bless your pretty heart, buddy! yeah, cool. no doubt. i'm actually working towards setting up an animation academy here in nigeria. you would DEFINITELY be our guest speaker during our 1st convocation ceremony! 1. what software can i use to create myself avatars (cartoons of real people), without having to use a content manager (virtual library) to build up the character. anything apart from adobe ? 2. i wanna do cartoons with some local content in it. eg, like making cartoons of our police, etc...how do i create the police uniform for instance ? (so that i can export to CTA2 or goanimate for animation). 3. how do i send u a vid or two of my work ? via email ? whats ur email addy ? 1. I use DrawPlus X8 and Manga Studio to create my characters for CTA2. You could use either to create cartoon avatars of real people. I sketch directly into Manga Studio and then trace my drawings with DrawPlus and to convert them into flash files for CTA2. DrawPlus can be used to create simple animations too. 2. See my first answer. The process is too long and complex to explain here. You'd need to look up some character creation tutorials for CTA2 - there are plenty created by the makers of the software that you can follow. 3. Post your vids to Youtube or similar video hosting site and send me a link. Most sites you can keep your videos private but can allow people with the direct link to view the video. My email address is in the left side bar of this page under Contact and Copyright info. awesome delivery! thanks for your time. however, character creation vids i saw for CTA2 are all based on its virtual library. i saw a couple using draw plus, but doesn't show how to make cartoons of a popular real person, or how to make a cartoon of myself. i paid great attention to how you created your look-alike on your blog, for CTA2, but i dont want to use a virtual library in this case. in your CTA2 animation, you looked really like a super hero! amazing i must say! .